There was an abundance of movie references and callbacks at Matt and Lisa’s delightful wedding in the A-frame pavilion of Hoyt Arboretum, from the Handbook for the Recently Deceased from “Beetlejuice” to a red balloon tied to a storm drain a la “It.” The best references by far came mid-ceremony, when hired swashbuckling actors (with swords and in full costume) stormed into the ceremony area and reenacted classic scenes from “The Princess Bride” — upon realizing Lisa was in fact not Princess Buttercup, and was most certainly not in need of rescue of any kind, the adventurers wished Matt and Lisa all the best and moved on to storm the (hopefully correct) castle. 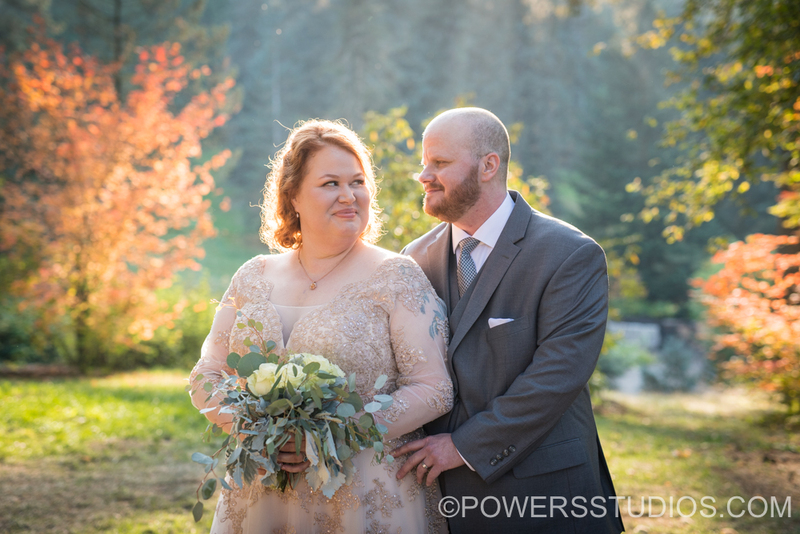 It was a beautiful fall day with perfect light filtering through the trees. A wonderful setting for a small and intimate wedding. Exactly what Matt and Lisa wanted for the day — being surrounded by greenery, delicious food, friends and adoring family. Congratulations and best wishes to you both!